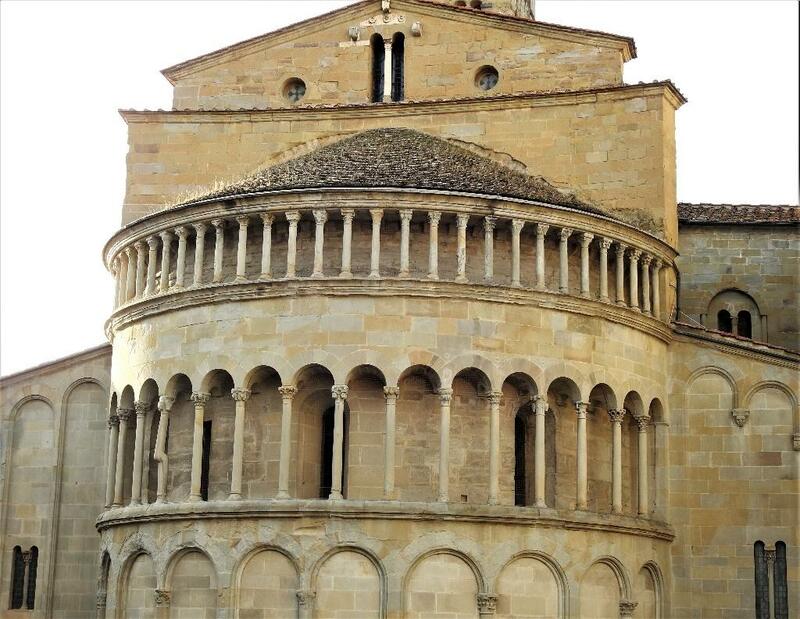 What Do You Know About Arezzo? 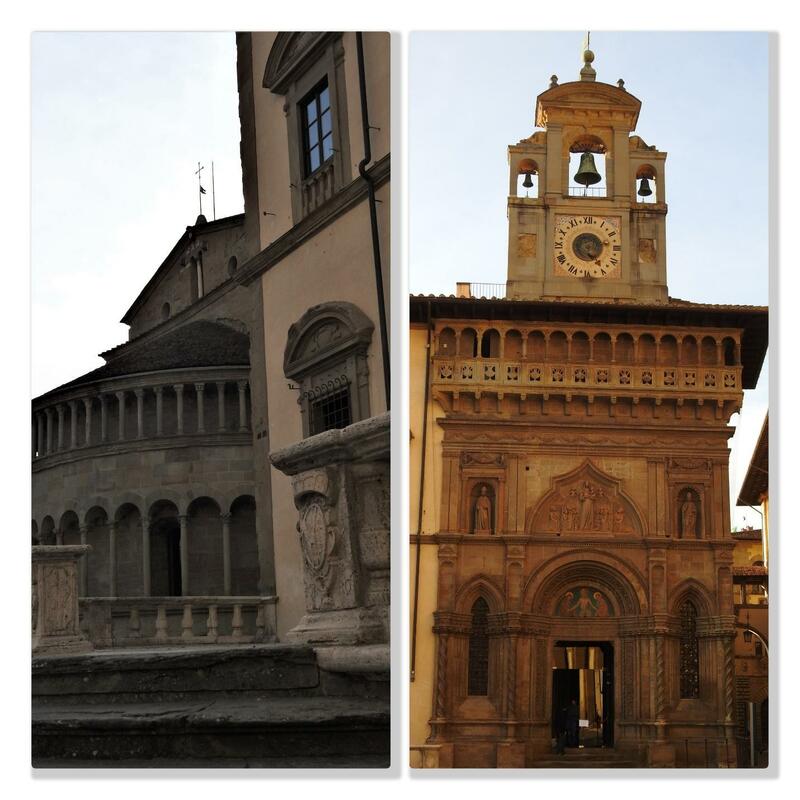 Every time I visit Florence, I promise myself I will take the short train ride southeast to Arezzo in the heart of Tuscany. 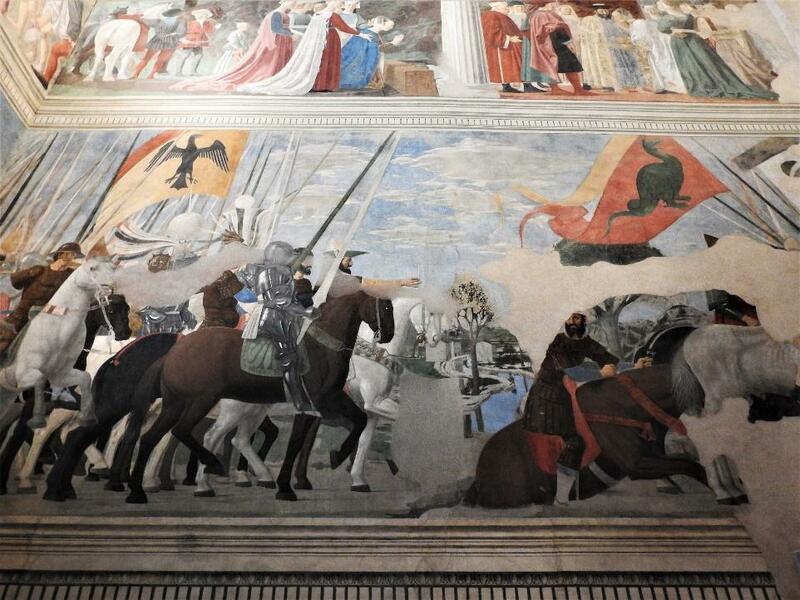 I have been yearning to see The Legend of the True Cross fresco by Piero Della Francesca. 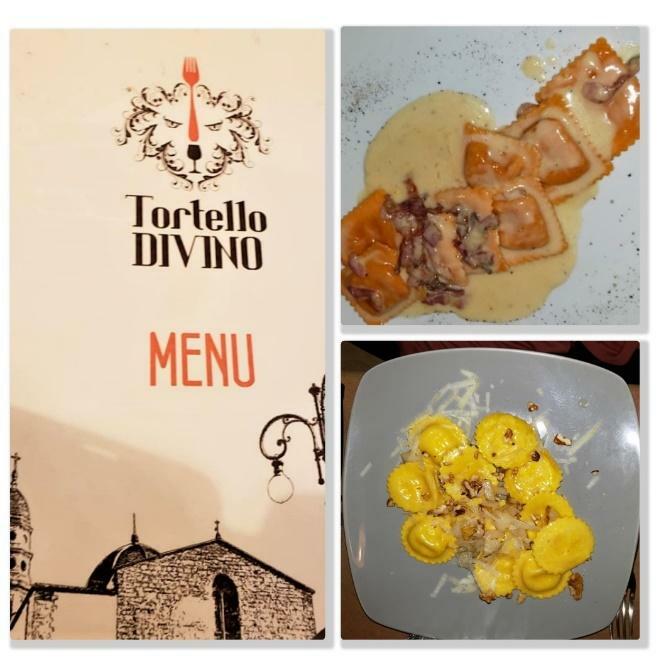 Last month I finally tore myself away from Florence for one night to experience the flavor of Arezzo, its people and the art hidden a stone’s throw away from Florence. 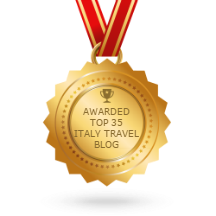 When I arrived, I was greeted at the train station by Debora Bresciani of Travel With Debora, (http://www.travelwithdebora.it/) a very experienced tour guide who lives and breathes the history of Arezzo. Debora is a woman after my own heart. After checking into my B&B, we immediately began our journey with a short walk to pranzo, lunch. 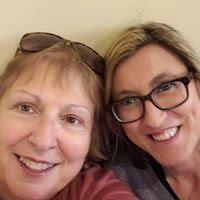 Deb and I discussed plans for the day while sharing some Chianti wine and stuffed pasta. Mine was pecorino stuffed ravioli with pears and walnuts (deliciosa!) while Debora enjoyed pumpkin stuffed ravioli. Both were so flavorful. 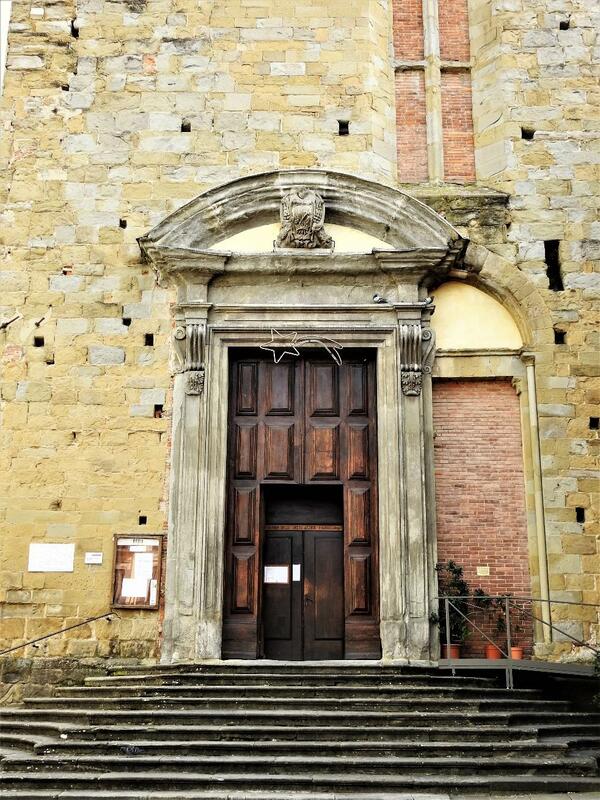 Now completely fortified for our journey, we attempted to enter La Badia, also known as, La Chiesa di Santa Flora e Lucilla, but it was closed for la pausa. 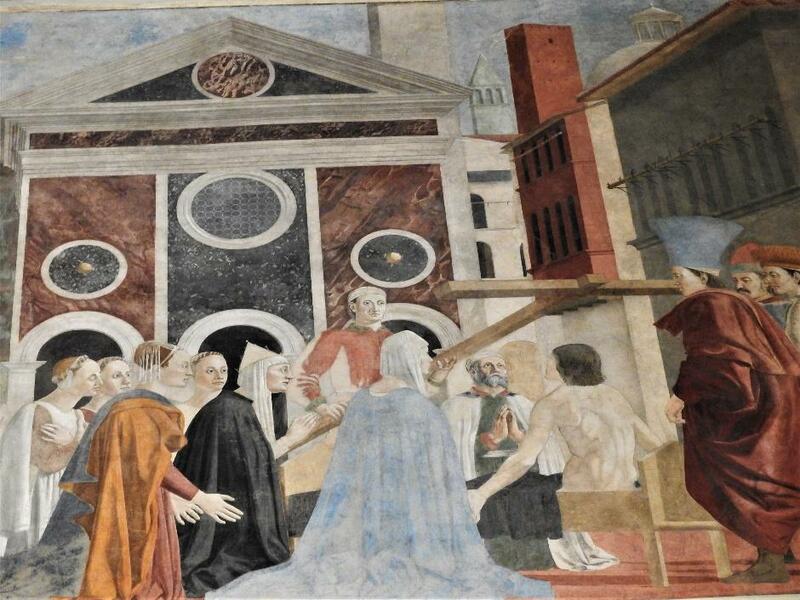 We changed plans and headed directly to La Basilica di San Francesco, an unobtrusive structure housing one of the greatest works of Renaissance art, The Legend of the True Cross by Piero Della Francesca. and the inspiration from the Holy Spirit to Emperor Constantine who chooses Christianity over the Roman Gods. 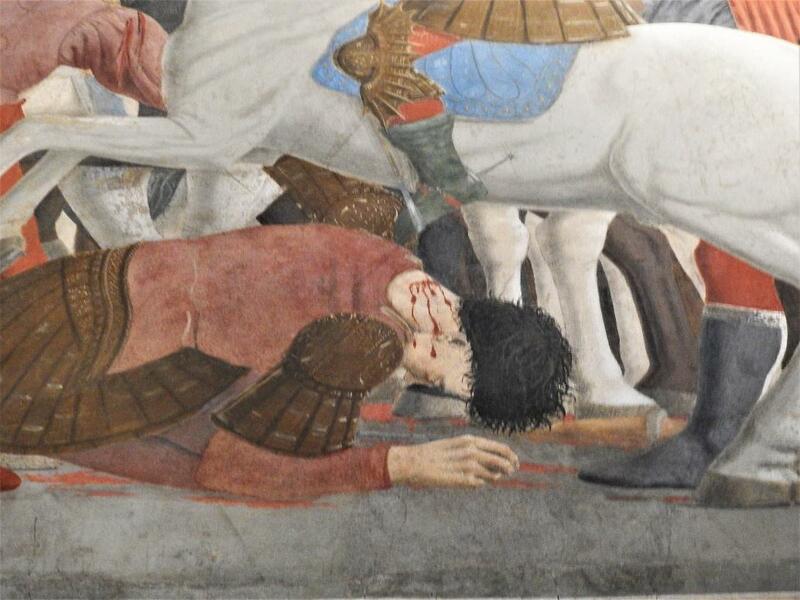 Even for non-believers, it is a dramatic work from the mid-15th century, an early Renaissance piece of balance, perspective, color and incredible detail. 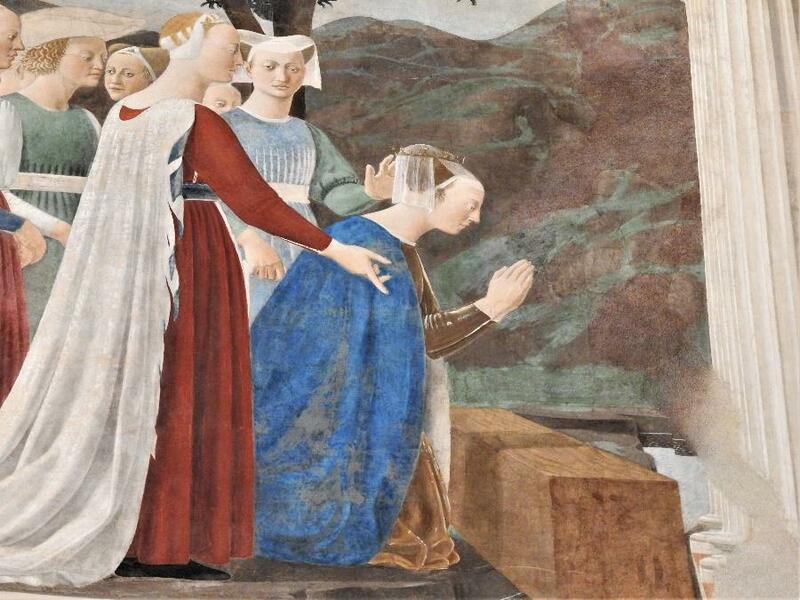 The attire is forward thinking for the period and, most likely, influenced clothing design in Arezzo. Righteous battles showing no blood. Whereas others do show blood. There is so much more to see in this church. You must see it with Debora to understand it all. 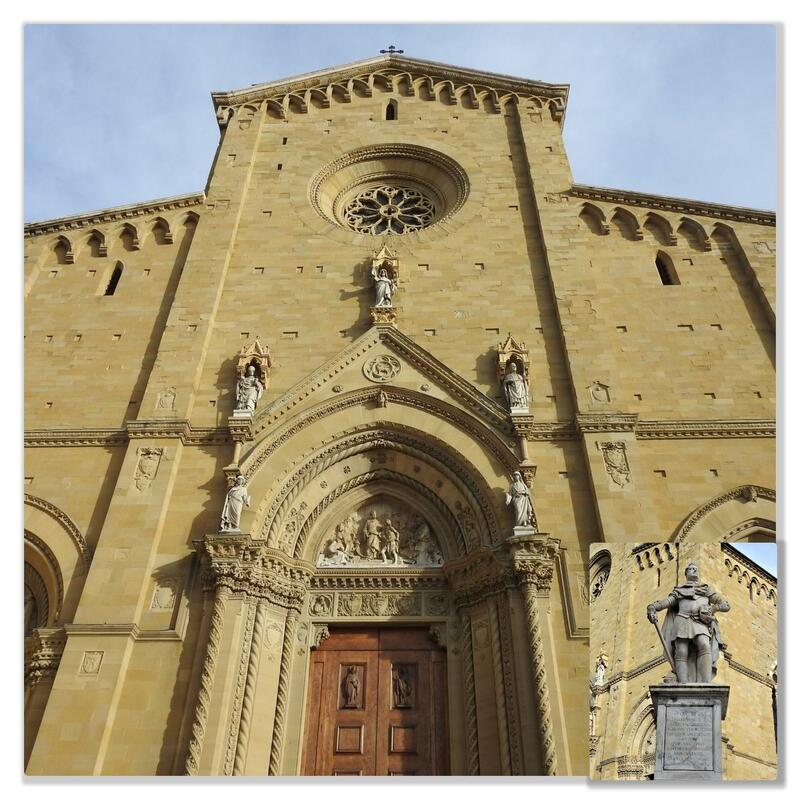 We wandered outside and walked to medieval Cathedral of Arezzo. 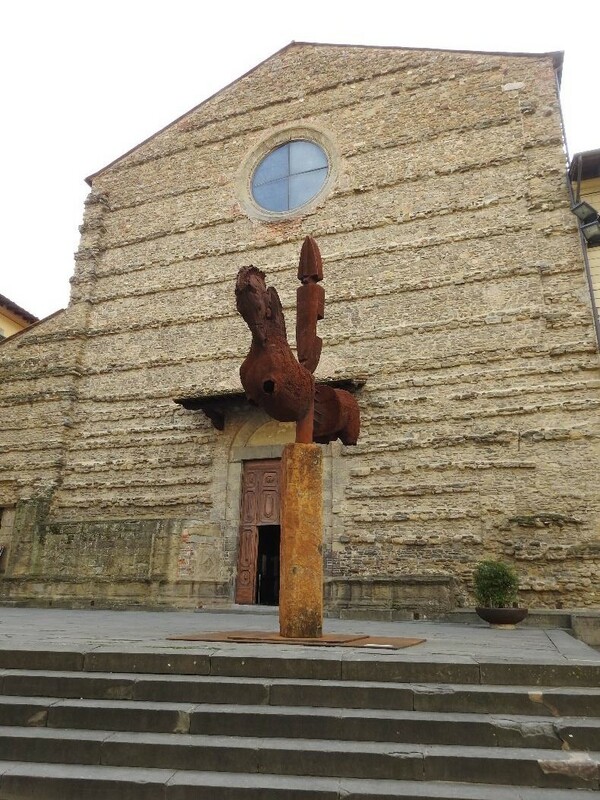 Outside is the only statue of a Medici in all of Arezzo. 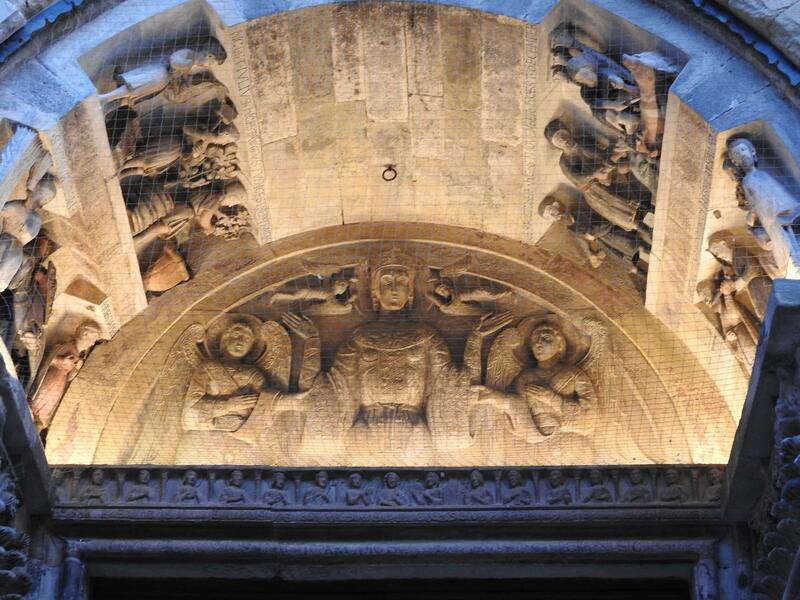 Walking past it, you enter into a sanctuary of peace and art. 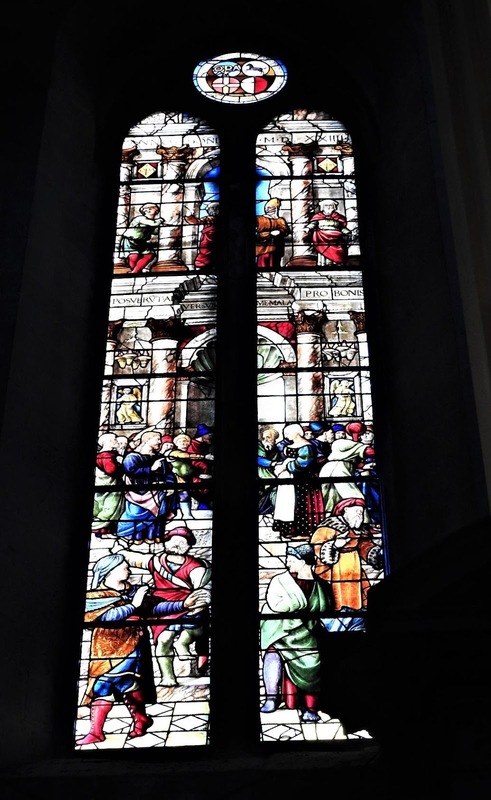 The lost art of true color stain glass windows is quite evident throughout the cathedral. Today’s artisans cannot replicate the depth of color and design as the formulas and talent were lost when the last of the guild passed away during the Dark Ages. 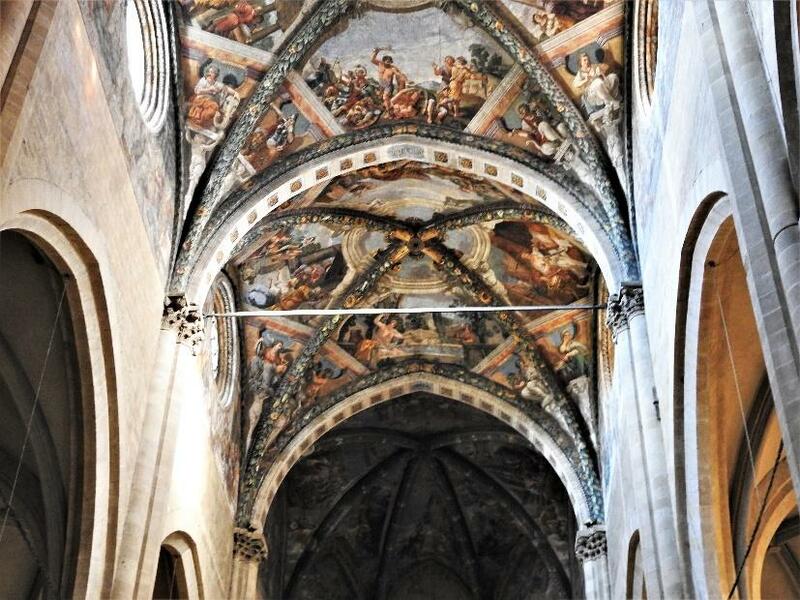 As you walk down the center aisle your eyes will be drawn to the ceiling, covered with extravagantly painted corbel arches. 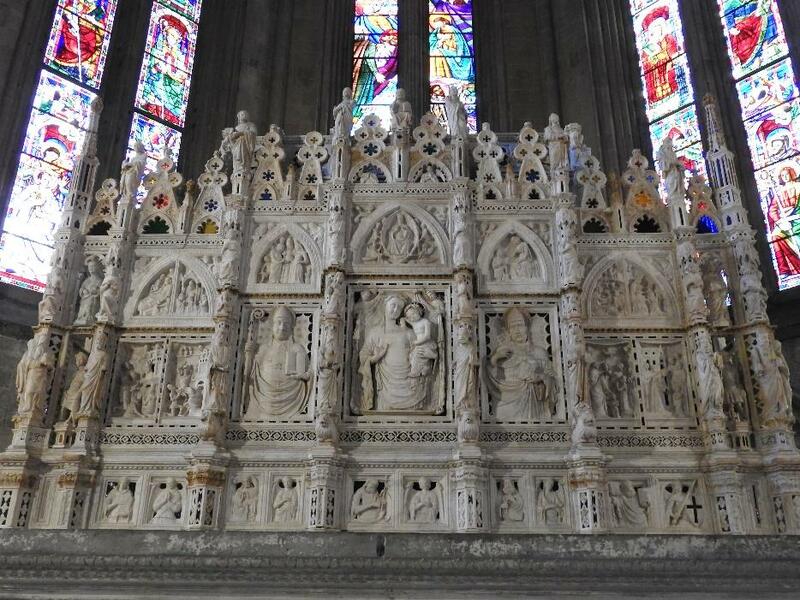 The altar area is dedicated to San Donato, the local patron saint who was beheaded. 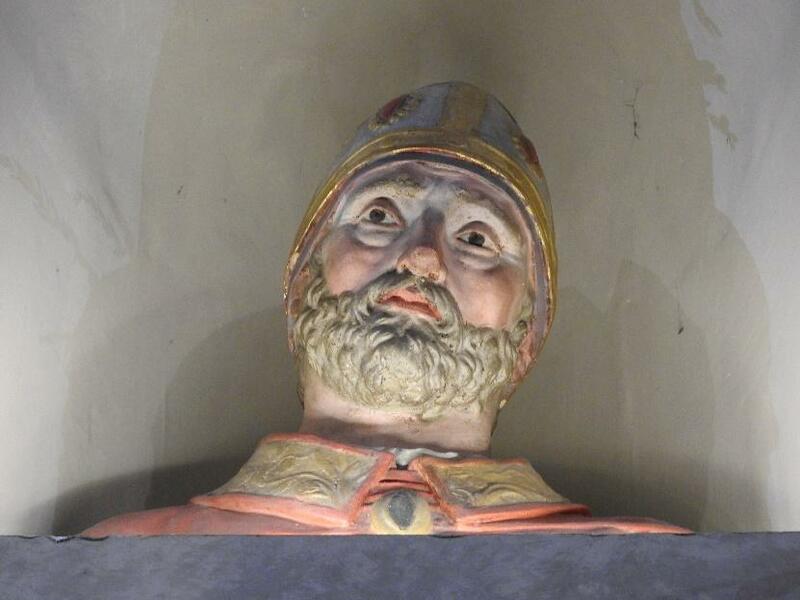 His remains are stored behind this ornate bas relief as is a likeness of his head. 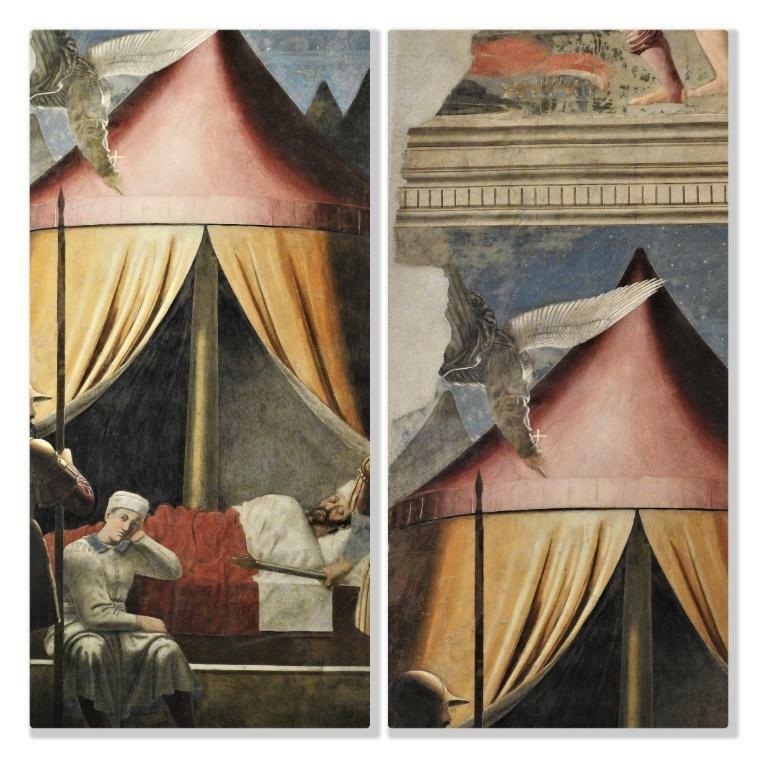 Another Piero Della Francesca painting lives within the Duomo—a study of Mary Magdalene. Her lamp is of special interest. It seems to shine from within. 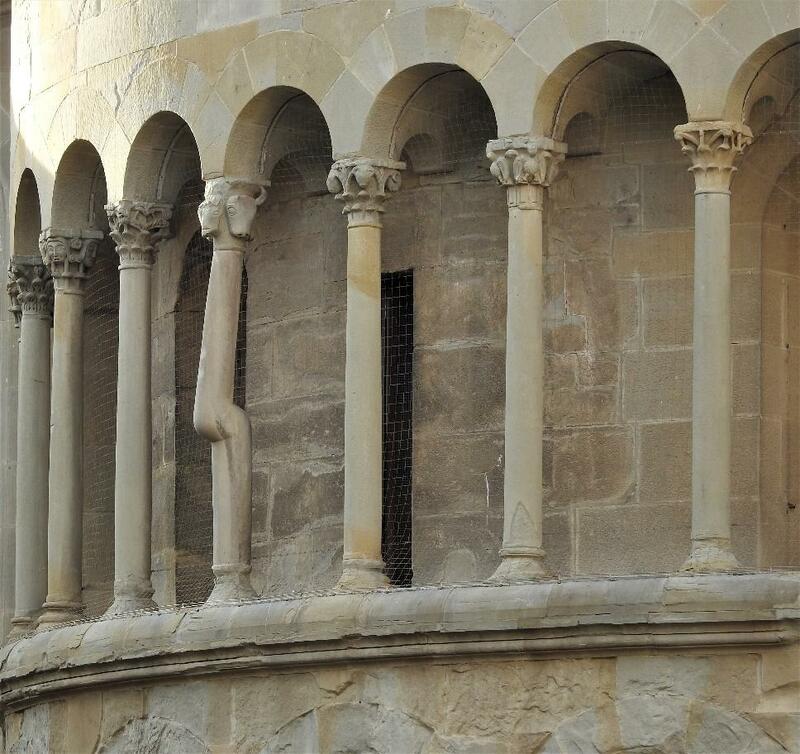 There is so much more to see within the Duomo. 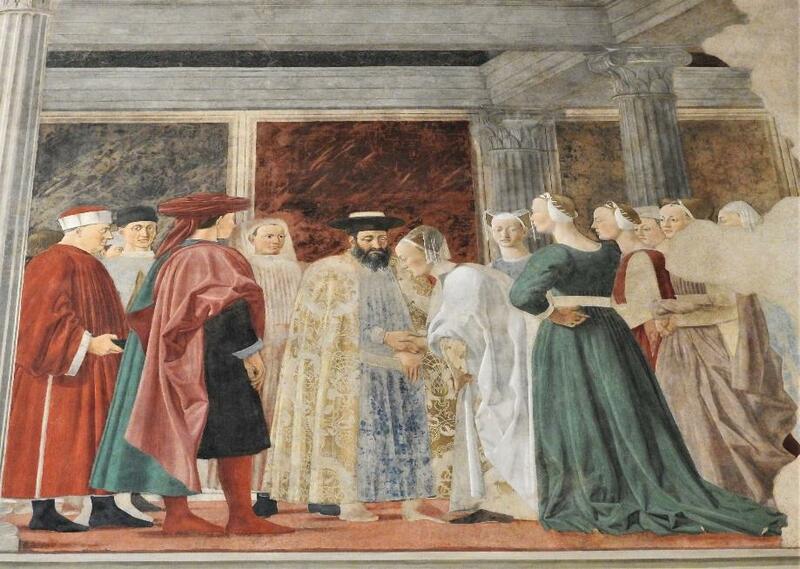 I was so happy that Debora was there to point out detail I could have easily missed. But it was time to move onto our next adventure. 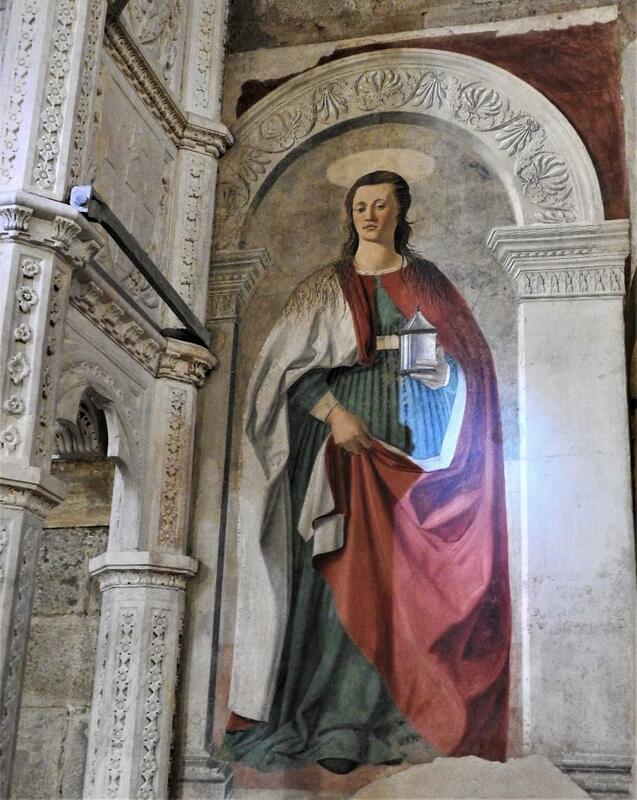 Deb and I walked through the Parco Passeggio del Prato, containing a very large work by Petrarca and by his home. 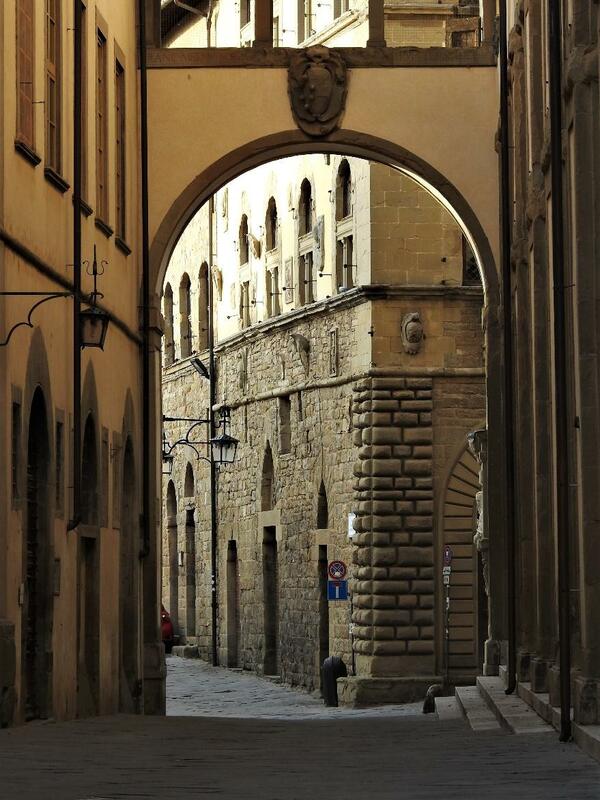 Through an archway and by the Loggia Vasari. 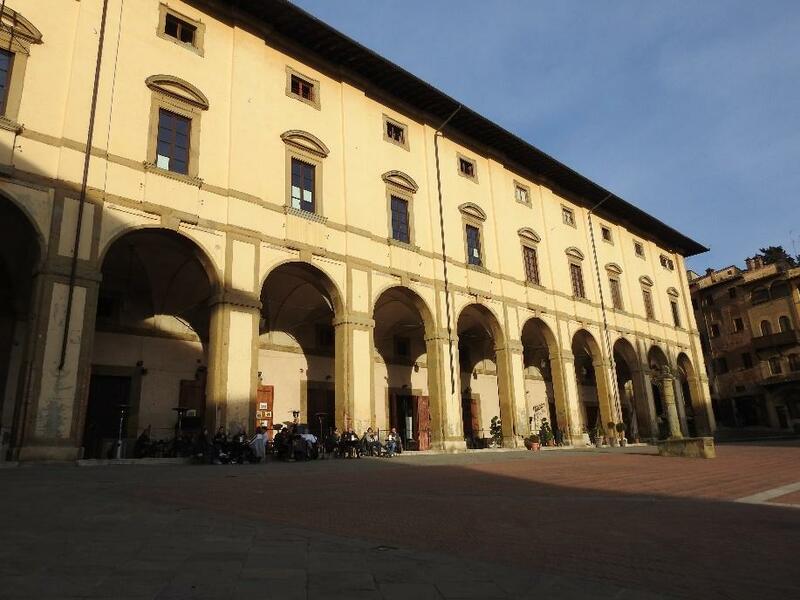 This enormous, slanted piazza is the premier meeting place for the people of Arezzo. It felt like a place I could spend hours within, chatting with the locals, learning about the history and the stories behind each building surrounding it and sharing an aperitivo. 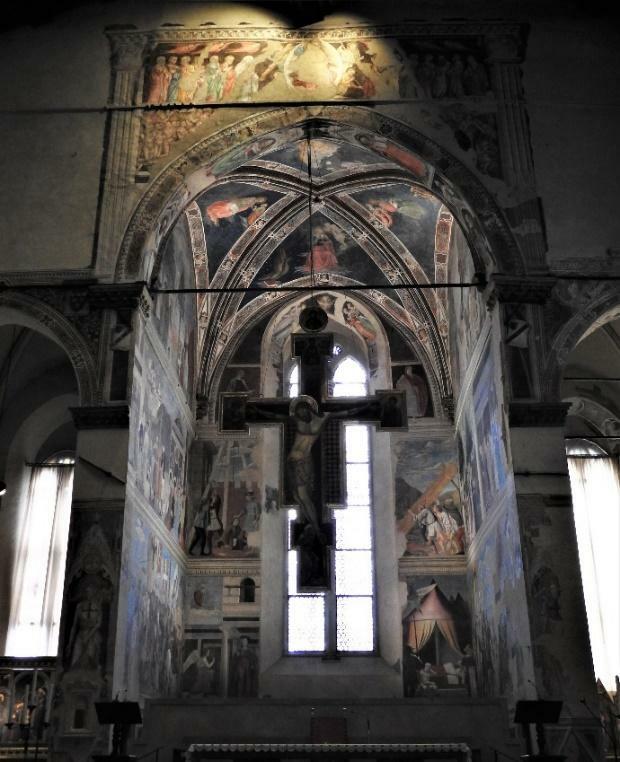 Santa Maria Della Pieve takes your breath away. 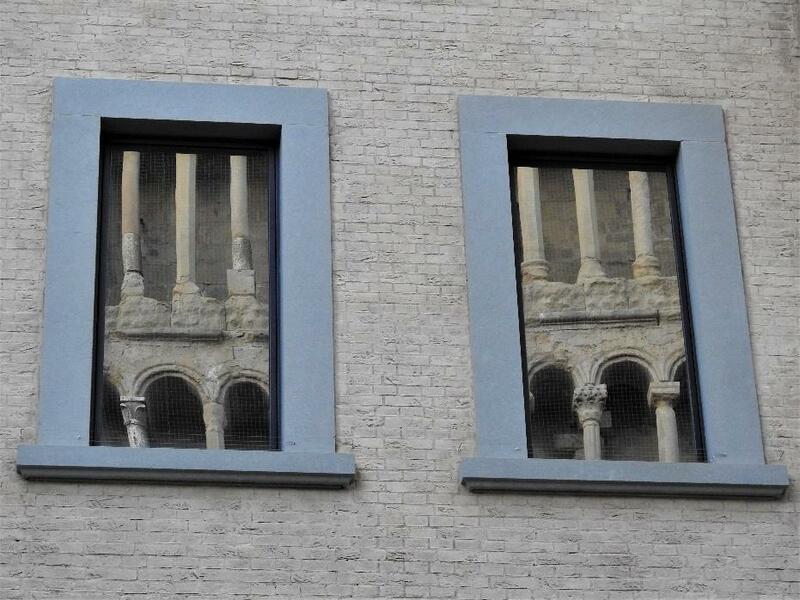 I especially loved the 3 rows of pillars shown below. You must experience this square yourself. We continued walking along some of the same streets immortalized in film by the Academy Award-winning movie, La Vita E’ Bella, until we returned to Badia Santa Flora e Lucilla. 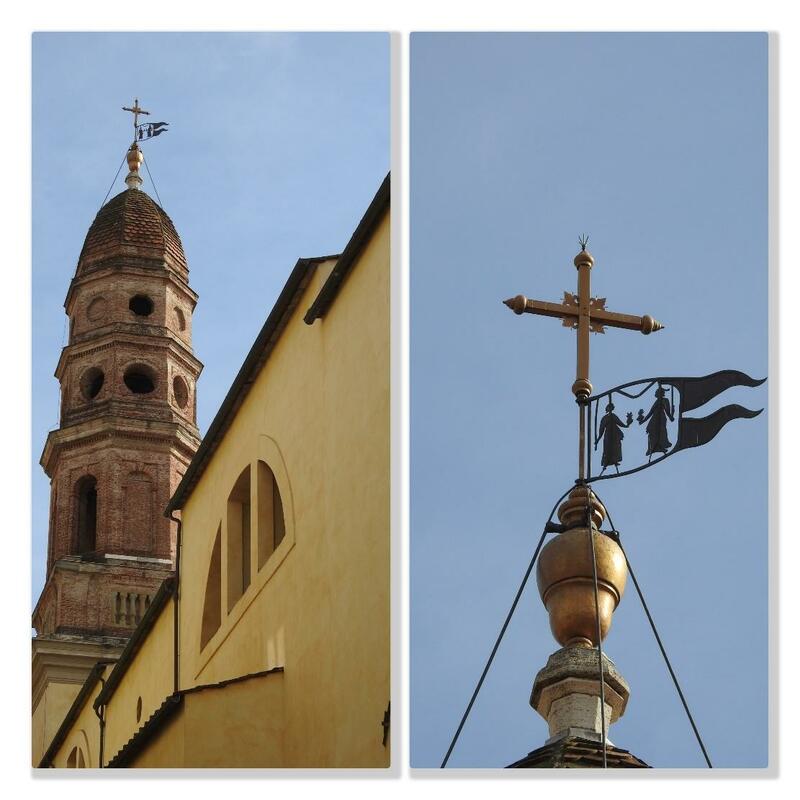 The bell tower displays the two saints blowing in the wind. We are once again surrounded by beauty and mystery. 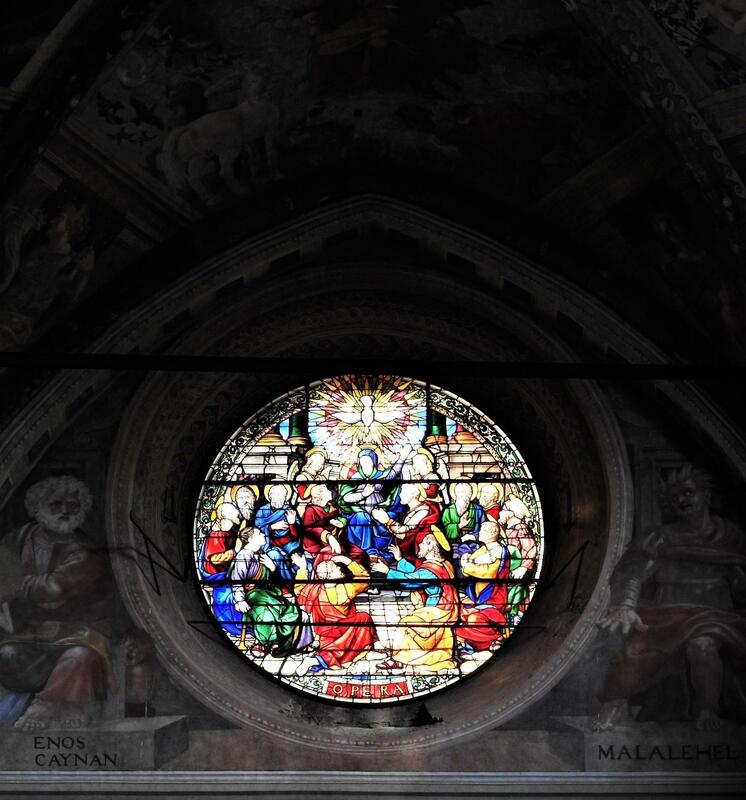 What caught my attention right away was the dome in the center of the church. The light shining from the oculus seemed brighter than it actually was outside. Wait! I do not recall a dome on this church. 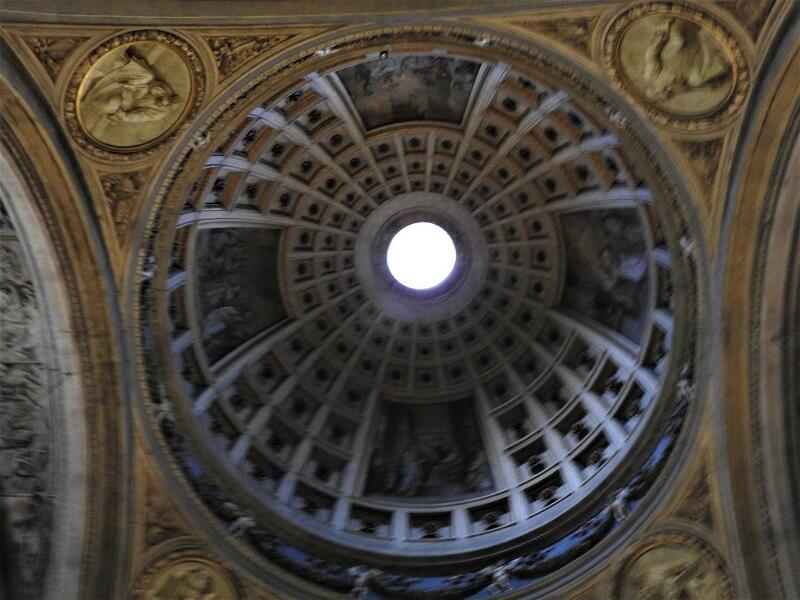 Debora explains that the dome is a falsa cupola, a faux painting, crafted by Andrea Pozzo. 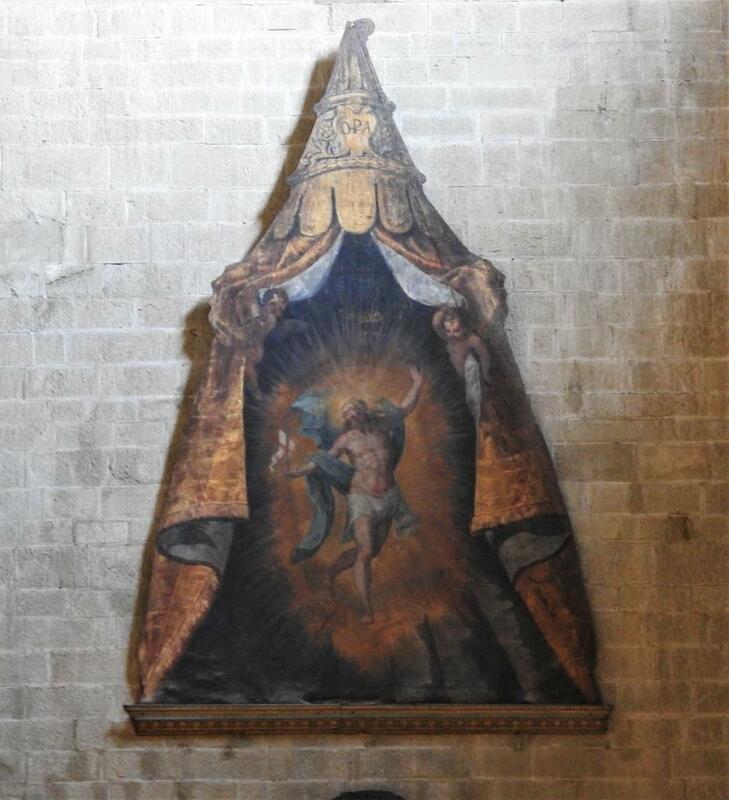 It was painted on a canvas, delivered to the church and positioned on the ceiling. Debora is a fountain of knowledge. 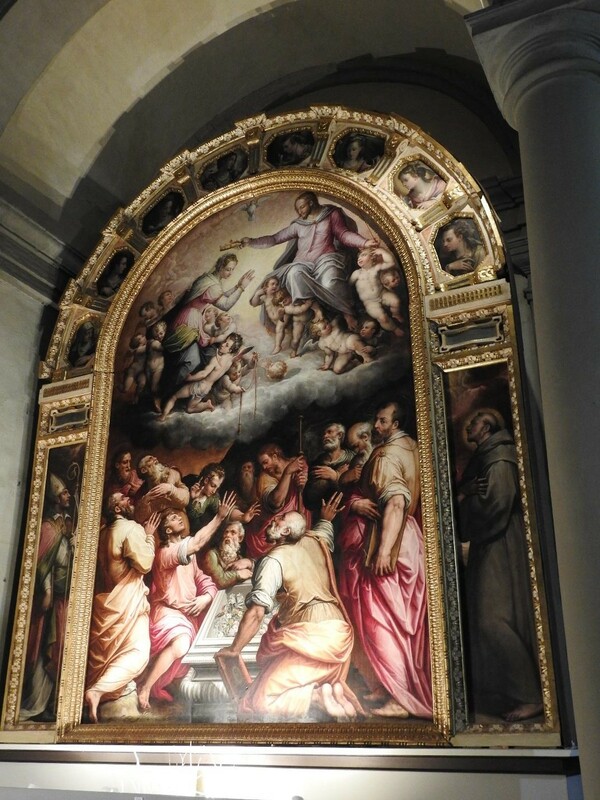 I wanted to see the Vasari painting in La Badia. 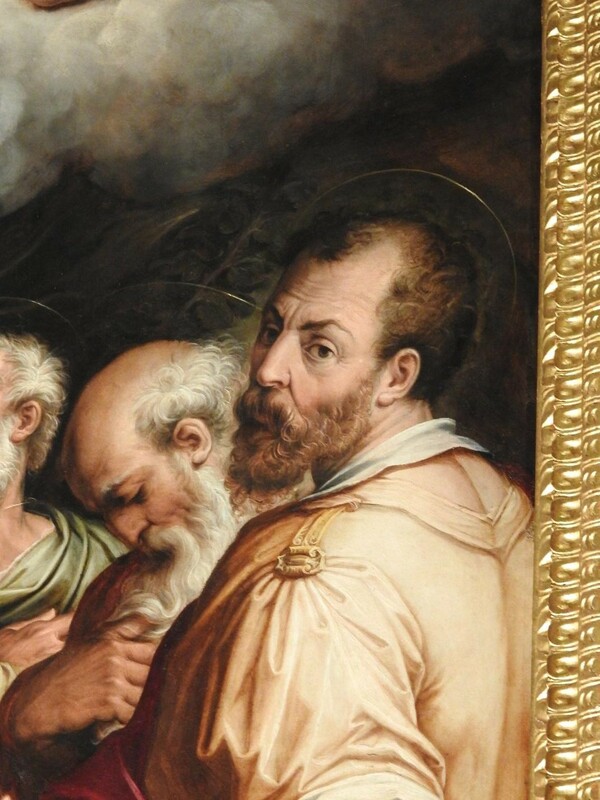 Debora pointed out his self-portrait within his work. And Sugar, a clothing store? The bar attached to it was called NO SUGAR. 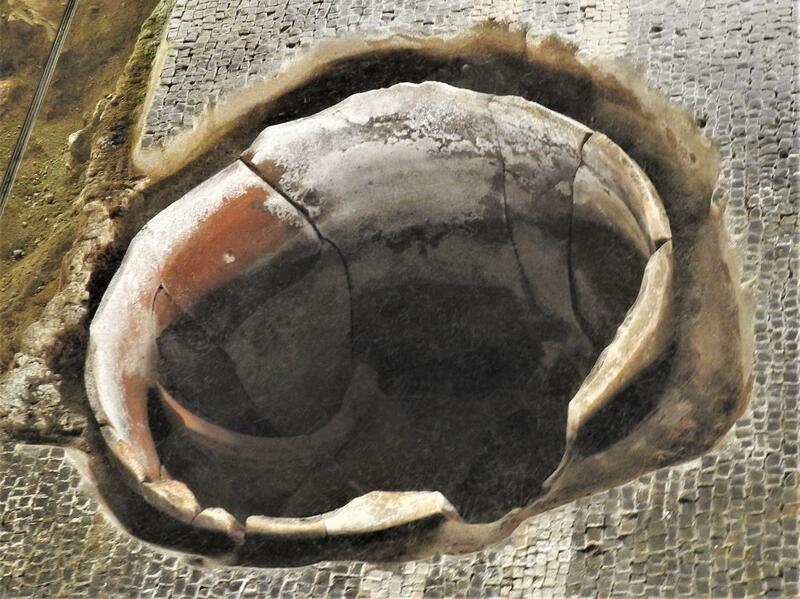 When they built the store they discovered Etruscan ruins beneath the floors. 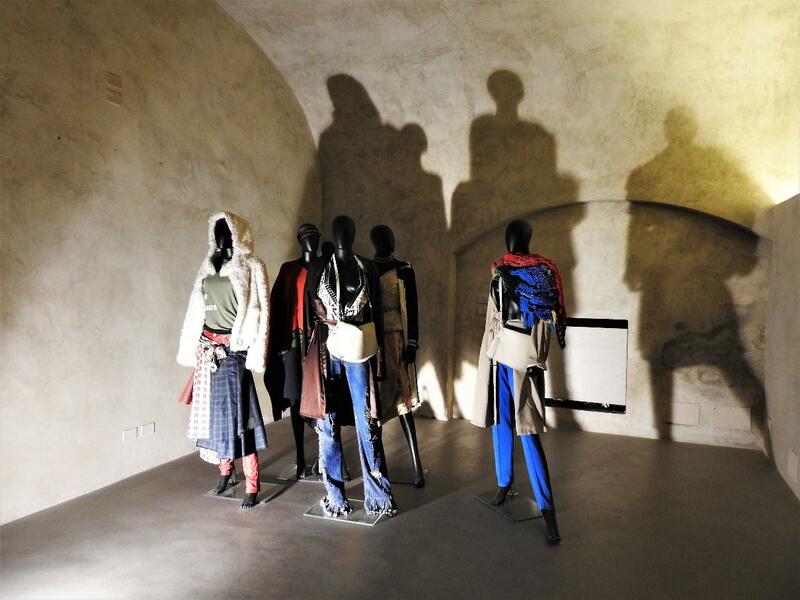 These ruins are in juxtaposition to this modern clothing display. For me, it captured the spirit I felt while with Debora in Arezzo—an ancient city with beautiful, historical art and beauty. Yet, it was filled with students, young people and life. One night was not enough. 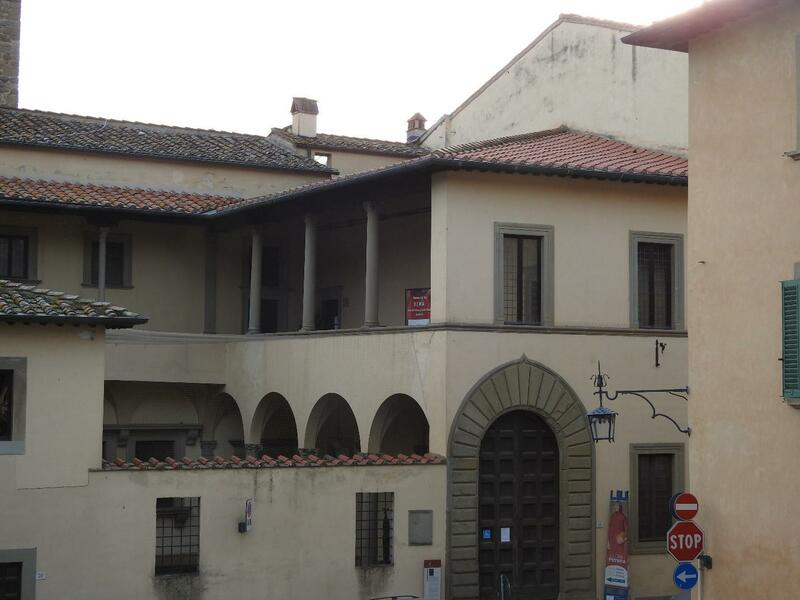 I would advise you to spend at least two or three nights in Arezzo. Debora can assist you in viewing more art, architecture and even visit their antique market or one of several exciting festivals. 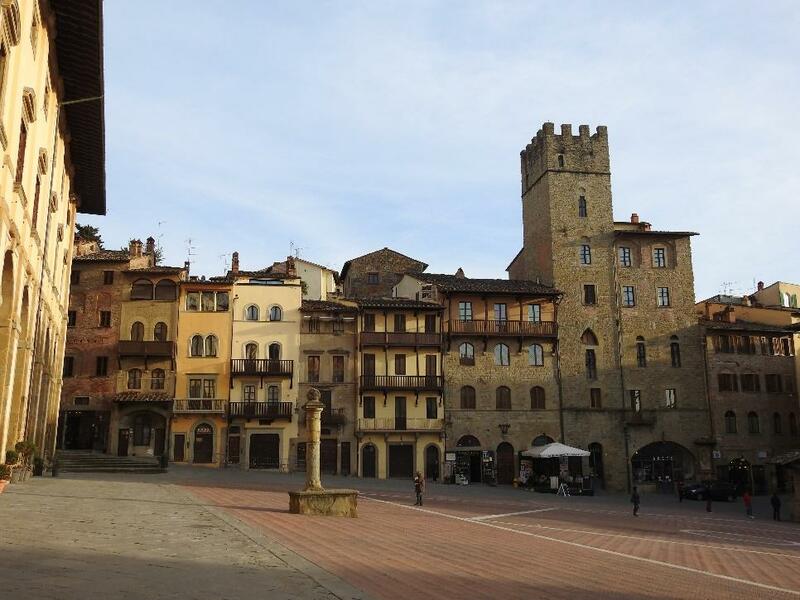 She can also accompany you to towns nearby such as Cortona. 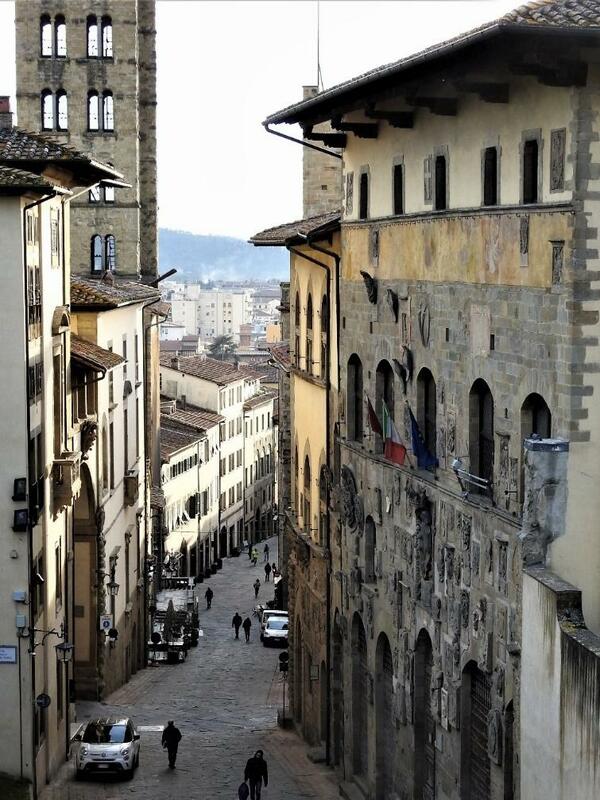 Let me know when you are ready to visit Arezzo. 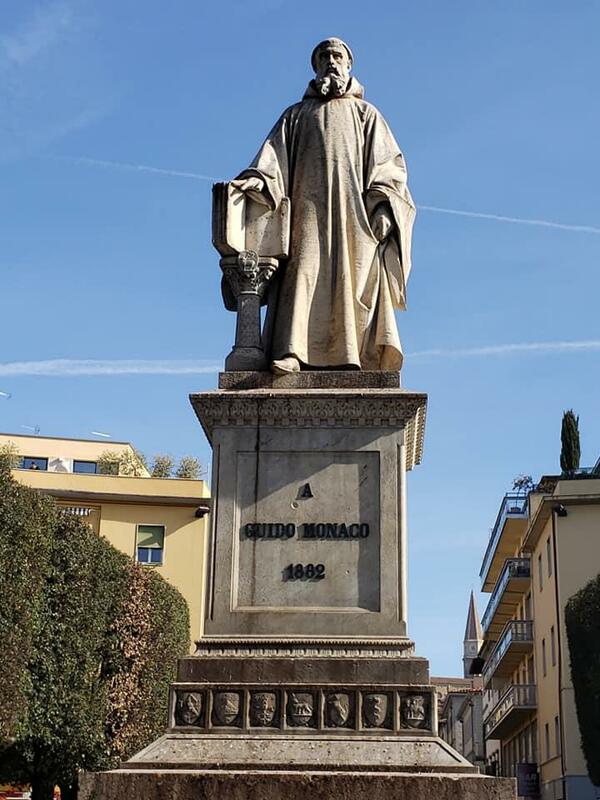 For now, let me leave you with the statue of someone close to my heart, Guido Monaco, a Benedictine monk who codified how to write music. 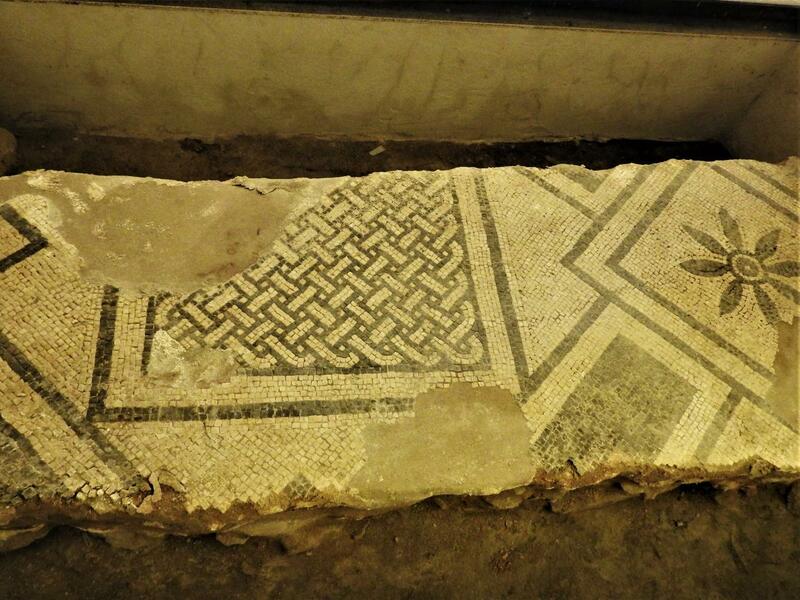 This was around 1000 AD. Grazie Guido!